BRIEN McVERNON is a man of many talents. Having enjoyed national success with acclaimed band KOO DE TAH, McVernon's talents have been showcased in a variety of Newcastle bands. They include the popular RAIDING PARTY, for whom he wrote the local top 10 hit Loveland, and enjoyed a stint as guitarist with the much-loved THE FUNBUSTERS, with whom he had a stint as a guitarist. He also hammed it up as a member of cult rock act GLAM GODS and created the theatrical experience of CIRCUS LIFE. More recently, McVernon has been busy writing music and experimenting with styles such as swing, rockabilly and jump blues in his band THE RETRO ROCKETS. As a lover of all music styles, McVernon has moved easily between the genres. His diverse talents have kept him in demand as a session musician and he has supported Australian artists such as GRAEME CONNORS, TANYA KERNAGHAN, COL ELLIOT, SLIM DUSTY and ANGRY ANDERSON. 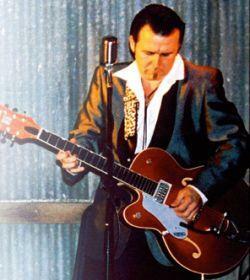 McVernon's repertoire includes covers by THE BEATLES, JIMMY BARNES, OASIS, JOHN MELLENCAMP and ROY ORBISON. McVernon will play at the GARDENS SPORTS CLUB , at Birmingham Gardens, on Friday from 7pm.